We have come inside. By winter solstice, hibernation should be on the agenda. But, until recently, our weather has been so mild that we have continued with outside play. This week, with short days, a little rain, a little bluster, some frost, and a lot of gray, we finally took up wintertime pursuits. A little Jack Frost artwork on our wooden steps. 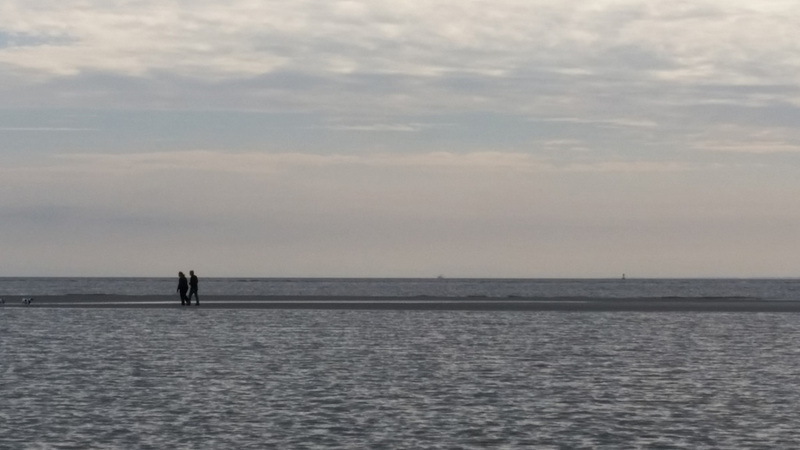 It looked almost like a woodcut. Looks a bit like the frost fronds. George is building a beautiful bookcase, I’m making a quilt, marking up the FEDCO seed catalog, and indulging in a frenzy of beekeeping research (what kind of hive, what kind of bees, how many hives, when to order …. I’m in heaven). Our property is an artwork of apples wedged in tree branches. Some little critter snacked on this one. We had a sunny day right before Solstice and I set out to take some fungi and moss photos. A puffball of some sort? With a spiderweb filament across it’s doorway? I grew up in New England’s woods and seemed to learn plant names by osmosis. But mushrooms, lichen, and mosses remained just that–mushrooms, lichen, and mosses–I never got any farther down the identification route. I’m pretty sure this is a turkey tail fungus. Nice against the stump patterns. Inspired by several fellow bloggers and determined to further my education, I found some lovely examples. But I’m still working on figuring out what they are. Unfortunately most of the online sites focus on edible fungi, so I’m still in the dark on most of these. I have been doing descriptive searches, such as “golden fungus surrounding branch” to no avail. Granted, I haven’t spent much time on this (too busy researching bees), but if I wait to identify them, I’ll never get this posted. I really need to get a book. Things aren’t any better on the moss identification front. But I love their miniature landscapes. After months without a fox sighting, this week George spotted this fellow sunning across the street. At first I thought he might be sick or dead, he was so still. But no, he just took advantage of a nice protected area to catch a little sun on a windy, raw day. Smart boy. Aside from the one bright day, we have had low clouds or have been socked in with fog. Gloomy outside, but oh-so-very cozy within. I appreciate the four distinct seasons here and the pendulum swing of winter solstice. Water crystals in our roadside ditch. Zoe loves the winter. Happy holidays. 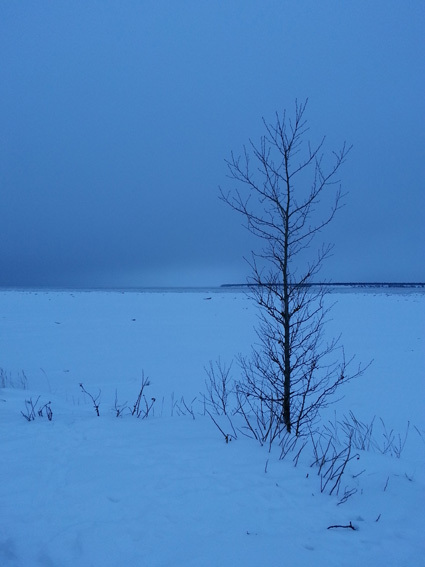 A year ago, I took the picture below on a midday walk along Cook Inlet in Anchorage on winter solstice. As you can see, it was a dark, dreary day. 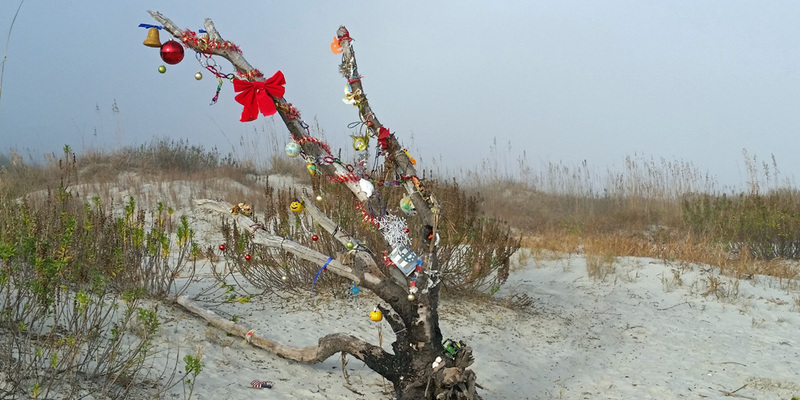 This year, I took the picture below on a mid-morning winter solstice walk considerably farther south and east, along the Atlantic coast on St. Simons, Georgia. As you can see, it was a dark, dreary day. 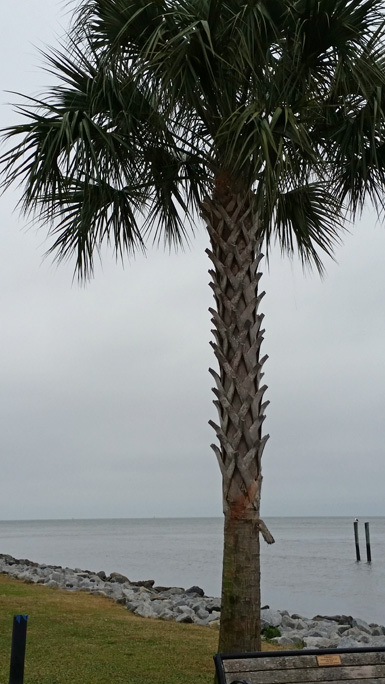 The palm tree is an improvement, though. We have been staying close to home (our little rental cottage) this past week as George recovers from rotator cuff surgery. He had the surgery on December 15 and it seems to have gone very well. The only glitch in the recovery so far has been a raging sore throat ulcer from the anesthesia tube. George has his first follow-up on the shoulder tomorrow and we will know more then about recovery time. While he has been healing, the weather has been unseasonably cold, with low clouds, intermittent drizzle or steady rain, and a biting wind. Zoe loves it–she’s a cold weather dog–and I enjoy my beach walks in all weather, but photo opportunities have been few and far between. 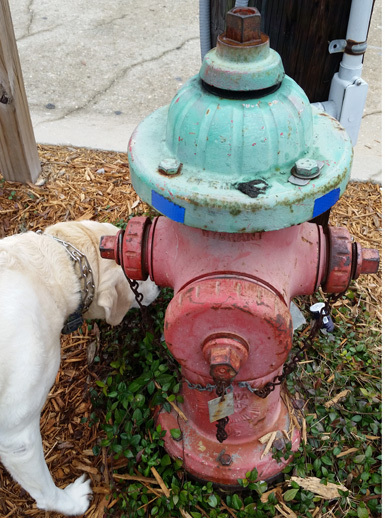 Because all of my recent photos were variations on gray gloom, I will try to make this post vaguely informative on the topics of vegetable, animal, mineral, and the truly bizarre. First, vegetable–even in the gray gloom, the vegetation here is startling. If you fall asleep for too long, you may be in danger of waking up with plant tendrils creeping across your body. 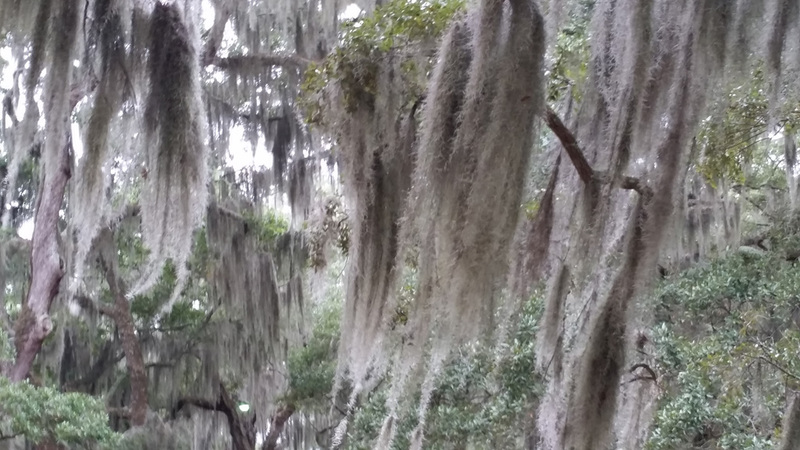 The Spanish moss seems to take on a life of its own, draping everything from live oaks to orange trees. It is an epiphyte—drawing its sustenance from the air—not the trees it inhabits. Still, it really knows how to move in on a host. It is gruesome and gorgeous at the same time. The moss is taking over these citrus trees. Left unchecked, the ivy also runs rampant, covering and ultimately breaking down everything in its path. On the animal side, this may be the doggiest place we have visited so far. 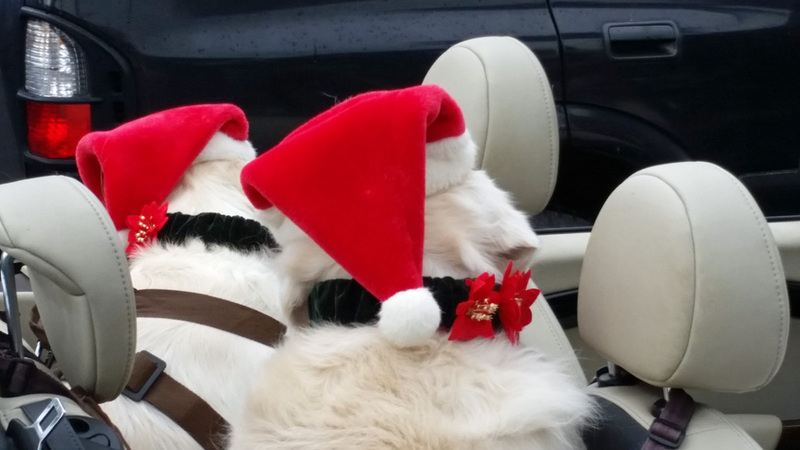 These beautiful golden retrievers were waiting for their owner with the top down in a mini-Cooper convertible in the grocery store parking lot, in full Santa regalia. They appeared to feel that the costumes were undignified and below their proper status. I agree. The beach is a dog playground. If you don’t like dogs, you are out of luck. 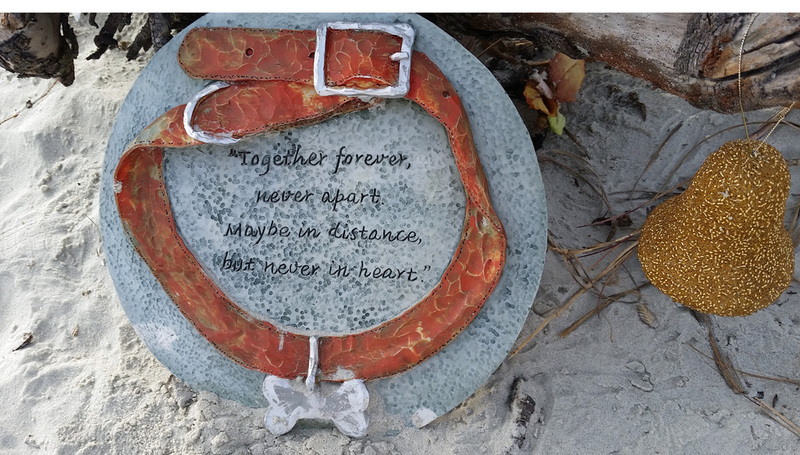 This dog tribute was below a holiday-decorated driftwood tree on the beach. In a jarring contrast with the dog-love atmosphere, the sidewalk drainage grates are potential dog leg crackers. 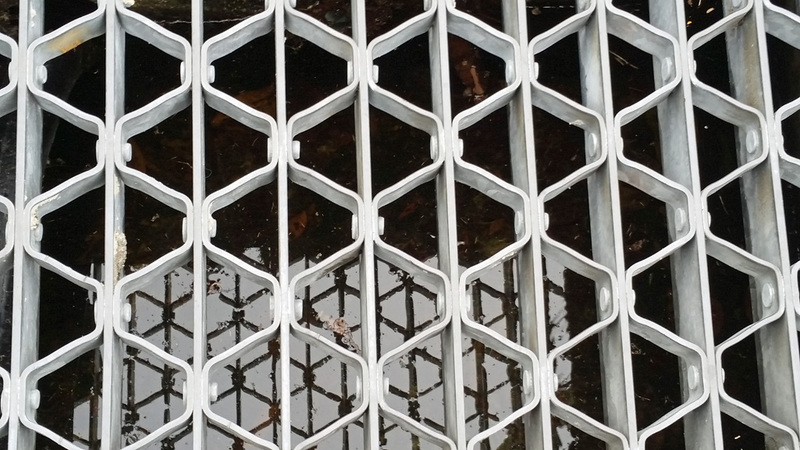 The grates have enormous openings, just perfect for a dog’s leg to go straight in—first it’s a gotcha, then try to move and it’s a crunch. So far, Zoe has carefully walked around them, but I hope she will not be distracted by the multitude of roaming cats and accidentally step in. 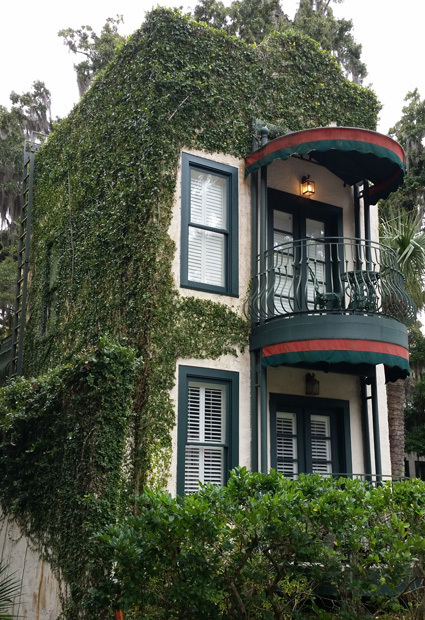 On the mineral front, St. Simons has a building material called tabby that is a combination of sea shells, lime, water, and sand. The tabby concept was brought to this coast from North Africa by early Spanish settlers and used extensively in early building by the colonists. Tabby is still used here, although it’s “phony” tabby, being shells mixed with cement, not the more labor intensive lime and sand. But, phony or not, tabby is a beautiful thing. I cannot resist a wall embedded with shells. Nice. Finally, the truly bizarre. 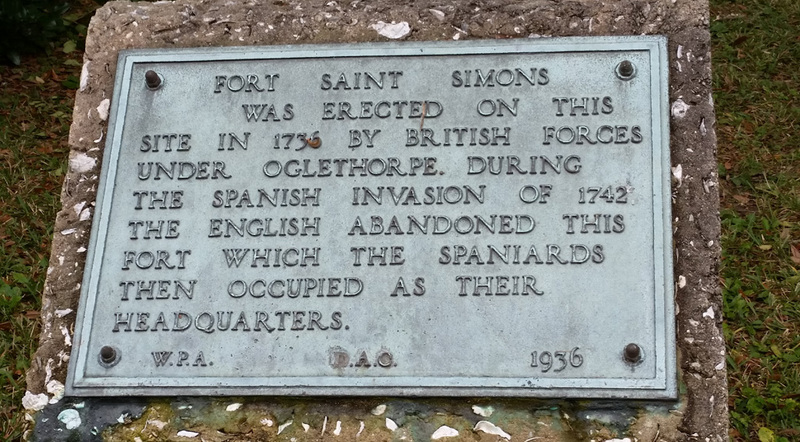 Everywhere we walk or ride on St. Simons, historical markers punctuate the path. This area has always been a coastal crossroads and the people here are proud of its history, with groups such as the Daughters of the American Revolution and Daughters of the Confederacy promoting local tidbits of historical knowledge. But “Daughters of the Cold War” seem to be conspicuously missing. And there should be chapter here because one of the most intriguing historical events in the area is missing a marker. Perhaps because it’s not exactly a tourist draw. It’s the “Tybee bomb,” an unexploded Mark 15 nuclear bomb lying somewhere in the offshore sediment just doing … whatever unexploded nuclear bombs do rolling around in the muck at the bottom of the ocean floor. In 1958, during a military training exercise a bomber and fighter plane collided above Tybee Island, outside of Savannah. The bomber was damaged but still able to fly and jettisoned the bomb before landing. Despite several searches, the bomb has never been found. Whether or not it poses a real threat (probably by slow leakage of radiation) is a matter of debate. But it is something to think about when gazing offshore toward the north. I wonder where it is and what it is up to. Let’s hope it stays intact. There’s a nuclear bomb rolling around out there somewhere. The days are getting longer! Happy holidays, Mele Kalikimaka, Merry Christmas, Happy Hannukah, Joyeux Noel, Feliz Navidad, Joyous Kwanzaa, and have a good Festivus. Enjoy.